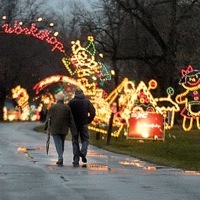 Everyone is welcome to enjoy this special walking preview of Lights on the Lake before it opens to vehicles only. The park will be open from 5-9pm and visitors can choose to park at either the Wegmans Landing, Salt Museum or Willow Bay lots. This is a great opportunity to get some fresh air and exercise. Walkers can cover as much of the two mile stretch as they desire and should dress for the weather. Shuttle service is not provided. Holiday characters will be on the trail and refreshments will be available for sale. Cars are not allowed on the trail for this special evening but will be admitted to the show beginning Thursday, November 14. We ask that you not bring dogs on this night but to come on the following evening, Wednesday, November 13 for the Lights on the Lake Dog Walk. Click here to learn more about the Hillside Work-Scholarship Connection.